Ever since discussion of the Michael Bay-produced Teenage Mutant Ninja Turtles reboot began, it’s been attended by reminders of Vanilla Ice’s cameo in Ninja Turtles II: The Secret Of The Ooze—primarily because we keep mentioning it. 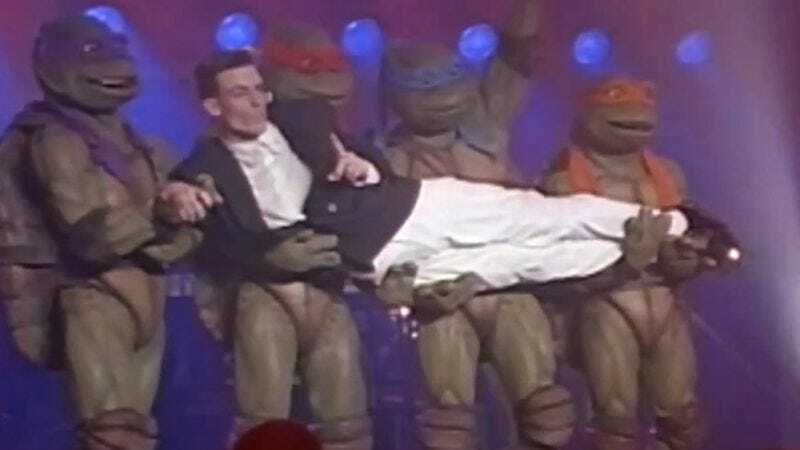 But it turns out the Internet isn’t the only place where “Ninja Rap” plays on an infinite loop; it’s also always on Vanilla Ice’s mind, as he tells Moviefone that he’s still a “Ninja Turtle at heart,” and that his Ooze performance remains “the highlight of my life and I’ll never top it.” Indeed, none of his life’s greatest hits, like “Ice Ice Baby” or Cool As Ice, could improve upon it, unless maybe someone sampled them. Or, unless Michael Bay responds to Ice’s enthusiastic entreaties to be a part of this new film: “We could do a remake of the ‘Ninja Rap,’ this time with dub-step! Or even [a role without rapping]. Anything, somewhere in there,” Ice said while reportedly laughing the self-aware laugh of the man who’s finally at peace with the fact that his entertainment career was ridiculous—the years of cathartically smashing through drywall and sanding cabinets alongside the Amish likewise breaking down his defenses and smoothing out his aggressions, until there’s nothing left but the succoring thrum of the Ninja Turtle bass. A bass that could now have some extra dubstep wobble, for today’s Ninja Turtles and Ninja Turtles at heart.